The Wild Geese are glad to welcome our new member, George White! George plays the mandolin, banjo, bouzouki, and concertina. Please go to the Bio to learn more of his story, and be sure to come check him out at the next show! As Summer is wrapping up, The Wild Geese are ramping up! We now have FOUR shows scheduled for September! That's right! 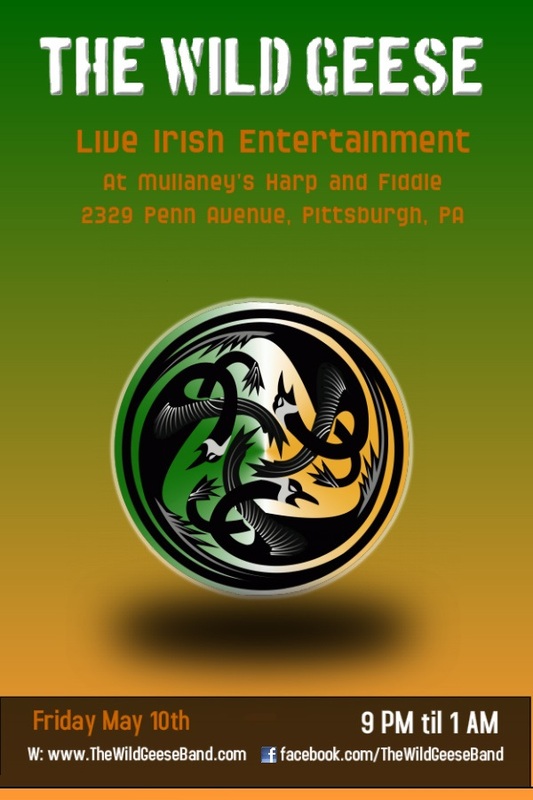 There is plenty of opportunity for you to come hang out with the best Irish band in Pittsburgh! We will be playing at the Pittsburgh Irish Festival on both Friday Sept. 6th at 4:00-4:45 and on Saturday Sept. 7th from 4:15-5:00! Both shows will be on the MPS stage. We will be playing at the Rochester Inn (505 Rochester Rd, Pittsburgh, PA 15237) on Sept. 21st from 9:30pm to 1:30am. We are also playing under the main tent at the Oyster Festival presented by Claddagh Irish Pub in the Southside on Sept. 28th, time TBA. We hope to see all of the familiar faces and plenty of new faces at each of these shows! New Show Scheduled at New Venue! The Wild Geese have scheduled a show for Friday, July 12th, from 9PM to Midnight at Claddagh Irish Pub in South Side Works! We are excited to try out a new venue and hope we can count on the flock to join us there! 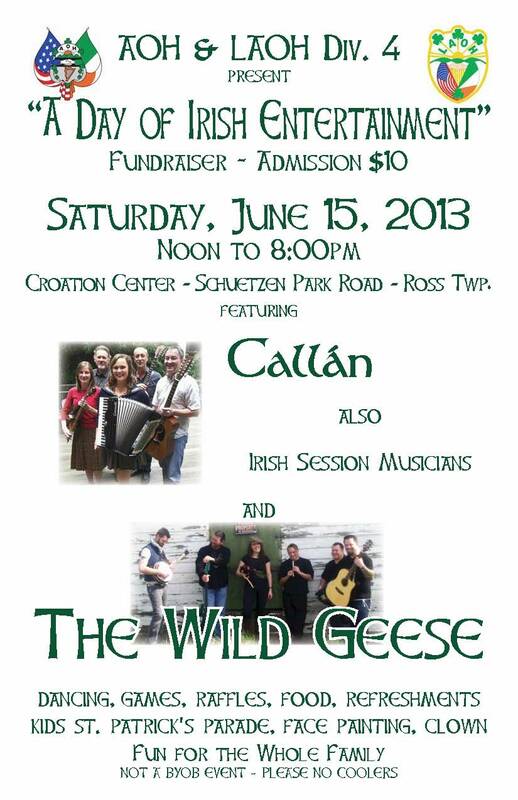 The Wild Geese will be playing at the AOH & LAOH Div. 4 "A Day of Irish Entertainment" Fundraiser with Callan on June 15th! Hope to see you there! Come see The Wild Geese at the Harp and Fiddle while heelping raise money for a great cause! Come see The Wild Geeese at the Harp and Fiddle this Friday, May 10th from 9PM-1AM. Live Irish music with good food and good drinks. Does a Friday get any better than that? The Wild Geese have added two new shows to their schedule! 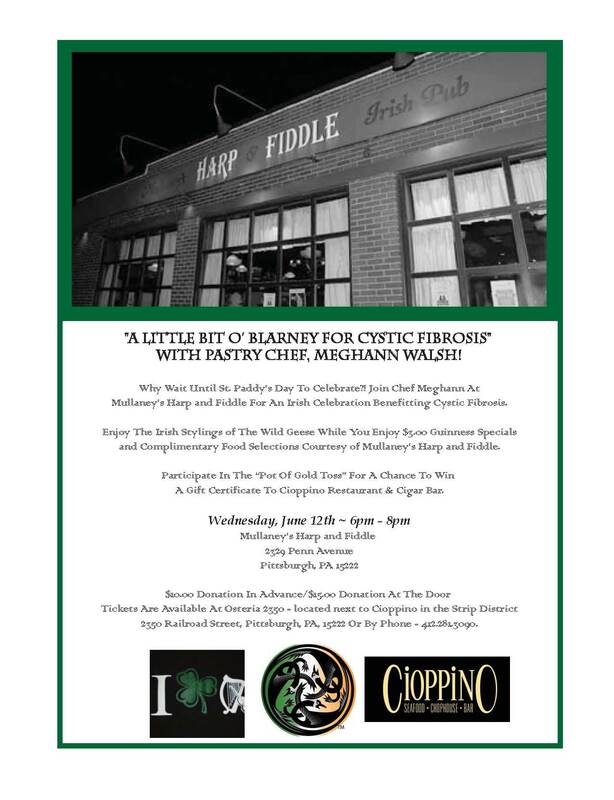 They will be playing at the Harp and Fiddle in the Strip District on Friday May 10th and Friday June 14th. Both shows will be from 9pm-1am. We hope you are excited! The Wild Geese have added a very talented fiddle player in Noe Woods! Be sure to check out the Bio section for her story, and come listen to her at our next show! Thank you to all of the fans that gave us a warm welcome at the Parade Day show at the AOH. We were told that the AOH has never had so many people before! You even drank them out of Guinness! So thank you for coming out and making our return show a great one! Based on the turnout on Saturday, we are expecting a big crowd, so be sure to call now and reserve a table! The Pittsburgh Irish Festival will be on September 6th, 7th, and 8th this year. This is a great honor for us as it is one of the largest Irish Festivals in the country! We will be sure to let you know when we will be playing as soon as we find out. While the Geese are getting prepared for this coming weekend's Parade Day show at the AOH, we are also busy booking more shows! Our next show is set for the Harp and Fiddle in the Strip District on Friday March 22nd, 2013. We will be playing from 9:00 PM to 1:00 AM. Be sure to call and reserve a table as we expect it to be packed!